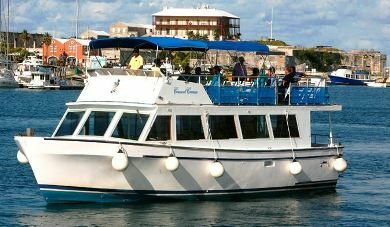 This is a two hours cruise on a 48-foot motor cruiser and is one of the most informative and highly entertaining sightseeing cruises in Bermuda. It has a licensed capacity of 75 persons. This cruise was earlier known as Consort Cruises and captained by Ronnie O’Connor. Since 2013, there has been a change in ownership although the offerings have remained more or less the same. It is now known as the Winsome Cruises. In my personal opinion, the quality of this specific tour 'Famous homes & hideaways' has improved a lot and has become much more interesting and entertaining since the change. This double decker boat is now captained by Jamie and assisted by his wife Tammy. While both are born and bread in Bermuda and have great knowledge about the island and its history, Tammy mostly takes the role of narrating many stories of the island and would answer virtually every question that you may have. The tour lasts for 1.5 to 2 hours and provides a wealth of well researched historical information as well amazing stories about the island. As you cruise along the shoreline, you will view charming colonial homes as well as exclusive neighborhoods of rich & the famous, known as Millionaire’s Row. The Captain will show you some those exclusive homes, such as that of Hollywood celebrities Michael Douglas and Catherine Zeta-Jones; then that of James Martin, Pioneer of Texas Instrument; playwright Eugene O’Neal, who’s daughter was married to Charlie Chaplin; illustrator William Denslow, famous for his work on the “Wizard of Oz” and lot more great mansions and landmarks of the island. You will discover tranquil island hideaways those are only accessible by boat. On this tour, you will also see classic Bermuda landmarks like the Gibbs Hill Lighthouse which is the oldest cast iron lighthouse in the Western Hemisphere. They also offer a 2-hour 'Famous Homes & Swim' tour which is similar but additionally takes you to the wonderful and serene Paradise Lake. You can take a quick dip, relax on a noodle on the crystal clear water of the lake or just enjoy the beauty from the deck while having a cocktail or a soft drink. And the surprise entertainment continues even on your return. Captain Jamie is a great vocalist singer and performs regularly at the Hamilton Princess hotel on the week ends. He will sing a few songs for you with his wonderful voice. One of the songs which he often sings (and unless he does, you must request him to do so) is "Bermuda is another world" ... a classic which was composed by the legendary Bermudian musician Hubert Smith. Sip a rum swizzle and enjoy the song as you sail by, it'll be a great memory to cherish. Complimentary soda & water are provided on board. Some features of Winsome Cruises boat includes spacious interior & shaded upper deck, cash bar and Restrooms. Winsome also offers sunset cruises as well as private charters. $50 per person (for both 'Famous Homes & Hideaways' and 'Famous Homes & Swim' tours). Both tours last for about 2 hours. They depart from the Dockyard at the west end, i.e. Kings Wharf port area (from Island Tour Center). Postal Address: Winsome, P.O. Box MA 224, Mangrove Bay, Somerset MA BX, Bermuda. 3) Bermuda Activities: All the recreational activities in the island. 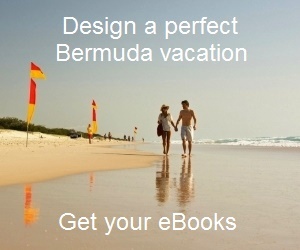 We just got back from Bermuda and this cruise tour was very enjoyable. We felt very comfortable on the boat and Tammy was personable and entertaining. We felt safe with Jamie, the captain and Mark, the ship's owner. I highly recommend this if you have the time while visiting Bermuda. Jamie also entertained us with a few songs, as he is a performer as well as the ship's captain.